There’s a sense of excitement in the air that can only be attributed to the Spring Racing Carnival. After all, this traditional and iconic Australian event is one that we all love. From the thrill of a bet on the horses to a refreshing beverage with the boys, each race day offers the opportunity to have fun, relax, mingle, and thoroughly enjoy yourself. Of course, the spring racing season isn’t just about friends and fillies. It’s also about fashion. With all eyes on your clothes, this is the time of the year to dress to impress. 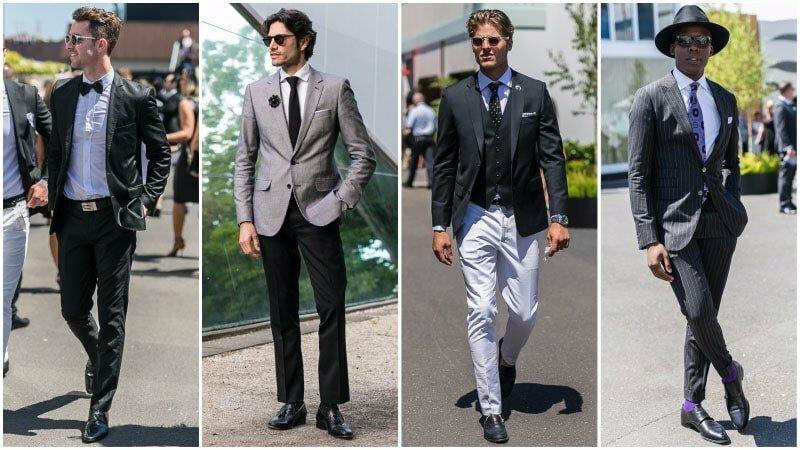 Luckily, we’ve got you covered with our guide to what to wear to Spring Racing Carnival 2017. The Spring Racing Carnival is built on tradition and heritage. As such, it’s important to respect the dress code and style etiquette of each race day. 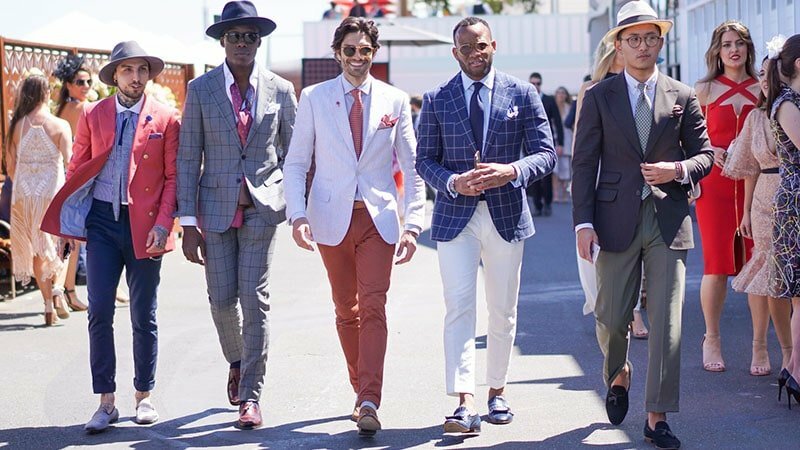 So, while dressing boldly for the races is encouraged, there are specific rules you must follow. Each day has a unique official flower and dress code. Therefore, it’s essential to brush up on the appropriate attire for every day you attend to avoid any fashion faux pas or embarrassing entry refusals. For those visiting the Members’ Enclosure or the Birdcage, being especially mindful of the strict clothing regulations is useful. However, this year, the VRC has lifted the mandatory requirement for men’s socks. So, if you feel like wearing your shoes without socks, you now can. Derby Day is one of the most formal racing events. The day, which features a minimalistic black and white dress code, is rooted in tradition and favours classic style. To nail your Derby Day look, you should select a well-fitting black suit and partner it with a crisp white dress shirt and black dress shoes. 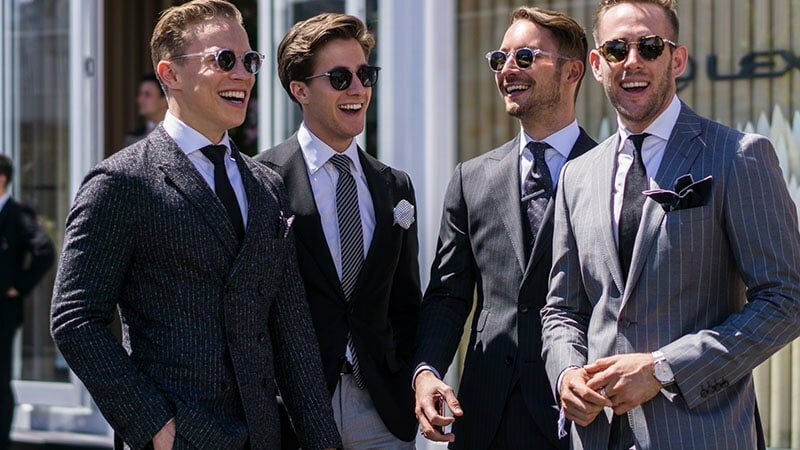 Alternatively, many men choose to don a grey suit on Derby Day to stand out in a sea of black. Although your colour palette must be monochromatic, you can add interest to your outfit with the aid of patterns and accessories. Just ensure that these details aren’t too bold or you’ll risk overpowering your traditional aesthetic. Also, note that the official flower for Derby Day is the cornflower. When it comes to the race that stops a nation, the fashion can be as loud as the spectators. 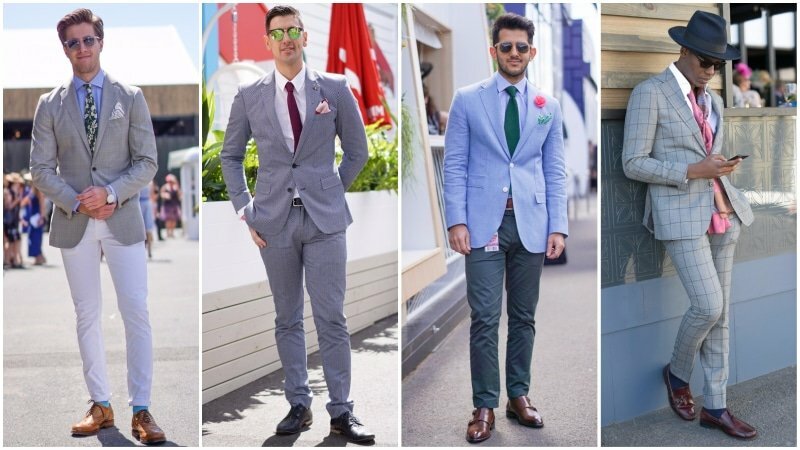 Melbourne Cup is known for its displays of bold and eye-catching colours by both the ladies and the gents. So, if you like to experiment with pop hues and daring designs, this is your day to shine. Just remember to keep things suitably stylish and smart. You are at the races, after all. A suit in a neutral tone such as beige can offer a refreshing look for the day. Alternatively, consider a navy or rich blue hue for something darker. To complete your ensemble, select a dress shirt in white or light blue and add bold accessories, such as a colourful tie or patterned pocket square. Depending on your look, your shoes can be either brown or black. The flower for Melbourne Cup Day is the yellow rose. Traditionally known as Ladies Day and formerly known as Crown Oaks Day, Kennedy Oaks Day is the time to embrace your softer side. The day, which boasts a romantic aesthetic, is characterised by a feminine style of dress. For gents, Oaks is a chance to leave traditional masculinity behind and try out a contemporary new look. From unique colours and pastel hues to fun florals and playful prints, the day’s style is joyful and creative. For a stylish look, consider pairing a light grey suit with a pink, white or blue shirt. Then, finish your ensemble with a tie and statement pocket square. Don’t forget about your shoes, either. A pair of brogues or loafers in brown or burgundy makes an excellent option. The official flower of Oaks Day is the pink rose, so you can also consider incorporating it or its colour into your look. The last race day of the Melbourne Cup Carnival is Emirates Stakes Day. Following on from the three previous high-energy race days, Stakes Day finishes things off in a more relaxed fashion. Ideal for the whole family, Stakes Day is quieter than Melbourne Cup, Derby and Oaks Days. As such, the attire is more comfortable and liberal. To nail this dress code, aim for a look that’s effortlessly smart and a little fun. Light and bright hues, as well as checks and stripes, make the perfect options for this chic yet somewhat casual day. 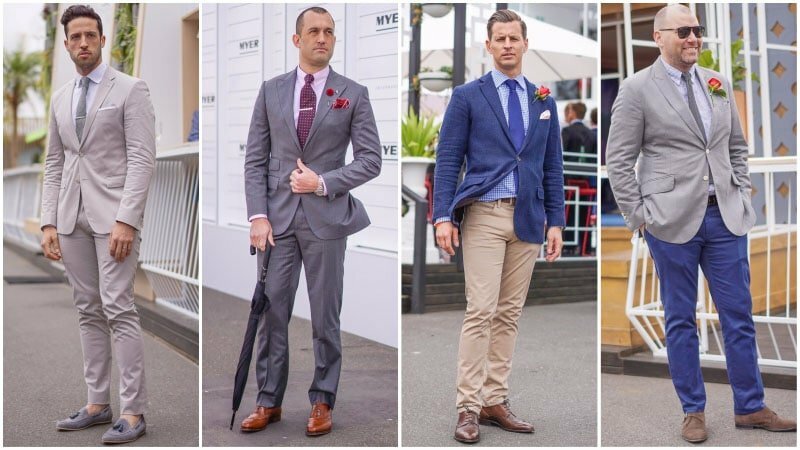 In particular, suits in soft grey, beige and striking shades of blue appear fantastic and complement the Stakes Day red rose perfectly. Don’t be afraid to mix and match trousers and blazers either and consider brown and suede footwear styles to complete your look. Be sure to check the dress code of each day before attending. For Derby Day, stick to a stylish monochromatic look with a well-fitting black or grey suit and white dress shirt. 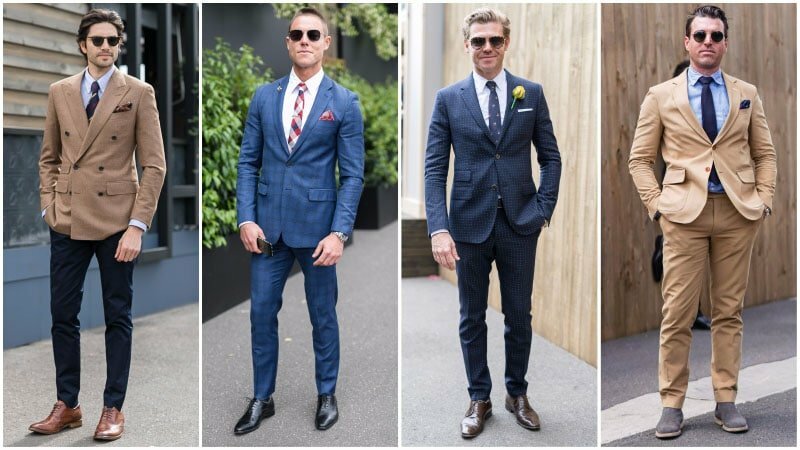 Dress to impress on Melbourne Cup Day with a beige or blue suit, light dress shirt and bold accessories. Embrace your softer side for Oaks Day with gentle colours and playful prints. Achieve an effortlessly smart Stakes Day look with light and bright hues, checks, and stripes.